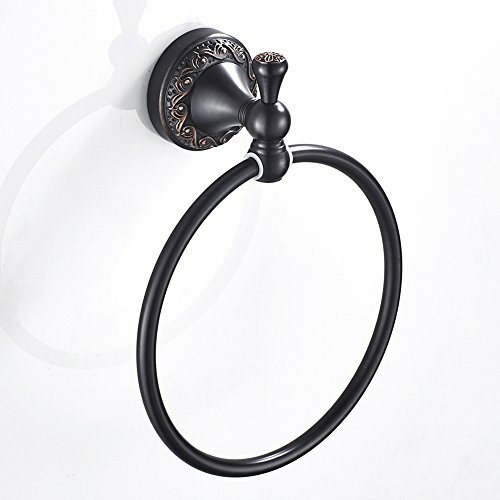 BLISSPORTE Vintage Towel Ring beautiful and elegance, design to coordinate with a variety of house decor. Solid Brass construction and Oil Rubbed Bronze finish makes this holder super anti-corrosive, study, heavy duty, rust free and dust proof. It will be a best choice to install this attractive hanger in kitchen, bathroom or cabinet to organize your bath towels, washcloth, dishcloth, ties, etc. 1)100% satisfaction guaranteed --- Blissporte committed to deliver outstanding product as well as excellent customer service, we care more about customer using experience of our product, your satisfaction is the highest priority. 2)100% money back guarantee --- If there are any questions, just contact us for replacement or full refund. Buy our hanger ring and give you a clean and tidy home from now on. BLISSPORTE engage in kitchen and bathroom accessories for many years. What we've been doing is providing reliable innovative products to create a simple, comfortable and convenient life. If you have any questions about this product by BLISSPORTE, contact us by completing and submitting the form below. If you are looking for a specif part number, please include it with your message.